Using pastry brush, coat 13x9-inch (3-quart) glass baking dish with oil. Line dish with parchment paper so paper also covers sides of dish. Brush paper with oil. Pour 1/2 cup of the water into large bowl. Sprinkle gelatin over water; let stand about 5 minutes to soften. Meanwhile, in 2-quart saucepan, mix remaining 1/2 cup water, the granulated sugar, cherry preserves, corn syrup and salt. Heat to boiling over high heat, stirring frequently. Continue to boil without stirring until mixture reaches 240°F (soft-ball stage) on candy/deep-fry thermometer or until small amount of mixture dropped into cup of very cold water forms a ball that holds its shape but is pliable. Carefully pour cherry mixture into bowl of stand mixer bowl; beat with whisk attachment on low speed until mixture is slightly cooled. Gradually increase speed to medium-high; beat 20 to 30 minutes or until mixture is completely cool and peaks form. Pour mixture into baking dish. Sprinkle a few drop red food color on top; use sharp knife to swirl food color into mixture (do not over swirl). Let stand uncovered about 4 hours or until firm. Sprinkle cutting board or work surface with about 1 tablespoon powdered sugar. Carefully invert dish onto board to remove marshmallow. 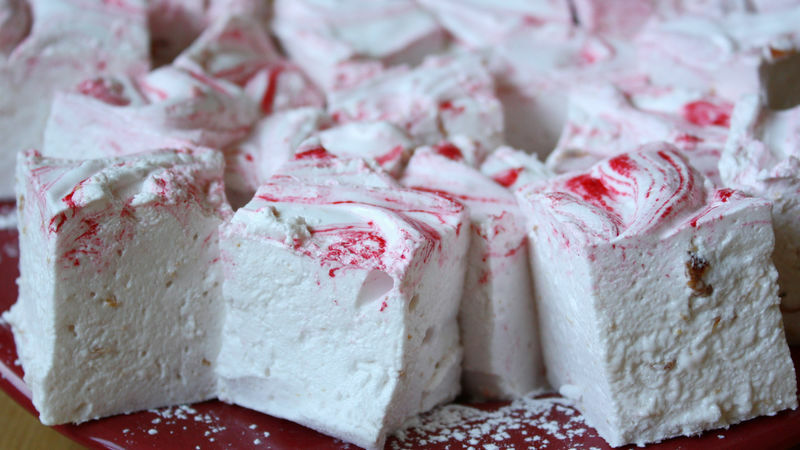 Using well-oiled knife, cut marshmallow into 1 1/2-inch squares. In bowl of powdered sugar, lightly toss marshmallow squares to coat; shake off excess. Store in airtight container at room temperature up to 3 weeks. Add 1 teaspoon vanilla to the mix for cherry-vanilla marshmallows. Dip marshmallows into melted chocolate for chocolate-covered marshmallows.